Two Murder Suspects Captured Today By SHERIFF VICTOR HILL’s Elite Fugitive Squad! 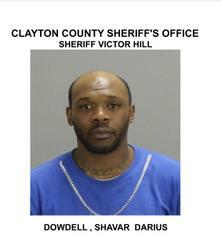 On December 20th of this month with the arrest of #1 on Sheriff Victor Hill’s Top Ten Most Wanted, all wanted murderers out of Clayton County had been captured. However, Clayton County Police Homicide Detectives changed the game temporarily when they did a masterful job of solving a murder that occurred back in August. Homicide Detectives obtained two murder warrants signed by a magistrate judge for two suspects yesterday. 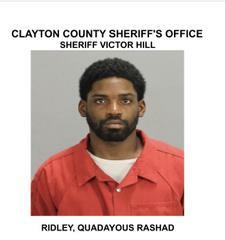 Quadayous Rashad Ridley and Shavar Dowdell were both placed #1 and #2 on the Top Ten Most Wanted by Sheriff Victor Hill yesterday. But no announcement was made to warn them that they were getting ready to be introduced in person to the Sheriff’s elite Fugitive Squad. Not wanting the year to go by without capturing all of the wanted killers, The Fugitive Squad began a manhunt for the pair yesterday which ended in the capture of both suspects today. One was captured in College Park and the other was captured in Jackson, Georgia. Both wisely surrendered without a fight. On August 11th, 2018 at a location in College Park, Ridley and Dowdell decided to robbed one of their drug customers when he would not agree to their price. When the customer took off running, both Ridley and Dowdell pulled out handguns and gunned him down in cold blood striking him several times in the torso. The customer/victim was dead upon the arrival of Clayton County Police. Both Ridley and Dowdell have now been both checked into the “Hill-ton” just in time to practice facing the wall for the new year at Georgia’s toughest para-military jail. Special Note: The Clayton County Police Department & Sheriff’s Office are excited to announce that crime is down in all categories for the year!!!! This can be attributed to the teamwork/brotherhood that now exist not only between our two agencies and the city police departments, but also the undying support we have received from the community. However, this does not mean we can or will relax. Instead, we will press the fight against crime until all criminals learn to stay out of Clayton County.